Simply and pretty cool eliminator fender kit. Better option for the horrible stock honda fender-tail that i´ve found. Really great quality materials and finished. Simply but high class !!! Very fast shipping to Spain and the price is so reasonable. Hope do business with TsT again. Advantages: Easy mounting kit but even more easy with youtube videos. Thanks to Mark and the TST industries for such wonderful products. 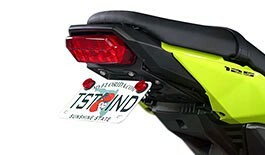 Mark was very much a professional sale man, he explained everything about TST industries intergrated tail light for my 2015 Kawasaki ninja 300. I installed my fender eliminated and my license plate today March 18,2017. My Kawasaki looks beautiful and sleek!